Five little Scotts ready to take you on a journey through twelve months in the life of Scottish kids. Meet Isla, Sophie, Dominik, James and Rashida - Scottish children representing a multicultural blend of culture and race that typifies our beautiful country. They will take you through a year in the life of Scottish kids, from celebrations to traditions to events, to our everyday way of life and the little things that make childhood so memorable. They are our Scottish childhood. A Scottish Year is a picture book bursting with national pride. It is a snapshot of who we are as a nation, blending our modern-day culture and lifestyle with past traditions and strong heritage. 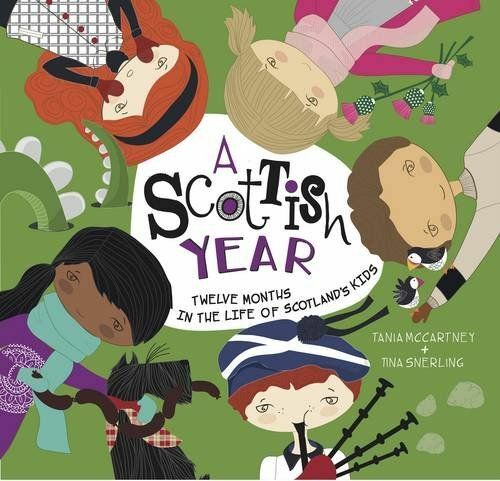 Its pages feature meandering text, dates and gorgeous illustrations, showcasing our five Scottish children at play, at school, at home, and enjoying the sights and sites of Scotland - from our heather-strewn Highlands to our historical cities, pristine outer islands and charming rural towns.